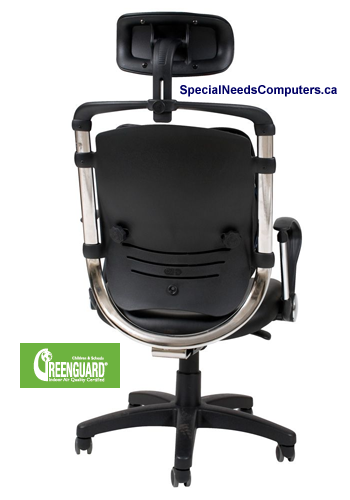 The Posture Perfect provides ergonomic features not available in any other chair. GREENGUARD Indoor Air Quality Certified and GREENGUARD Children & Schools Certified. Full-floating lumbar support panel is padded and curved to match the shape of the spine. Upholstery fabric is stain-resistant and durable, with flame-resistant foam padding. Meets the flammability requirements of California Bureau of Home Furnishings Technical Bulletin 117. BIFMA-approved tilt adjustment. Seat adjusts pneumatically from 16" to 20" in height. 5-star base includes 2" dual-wheel casters.